Home > About > News > April is National Community College Month! 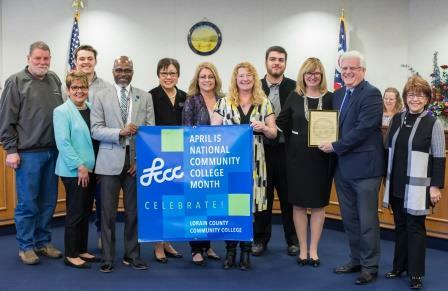 Every year at this time, LCCC and the more than 1,100 community colleges in the U.S., take time to celebrate April as National Community College Month. So designated in the 1980s, National Community College Month provides awareness of the critical role community colleges play in our country’s higher educational system. Ever since LCCC opened its doors in 1963 residents have used LCCC as a means to follow their dreams, whether that means preparing for careers or to transfer to a four-year college or university after earning an associate degree. In fact, one in four Lorain County residents have taken classes at LCCC and more than 36,000 have earned a degree. Read About Some of Our Great LCCC Students and Grads. The LCCC District Board of Trustees has governed the College since its inception. Nine members serve on the board, with six being appointed by the commissioners and three by the governor of Ohio. LCCC was granted a charter on July 15, 1963. Led the state in three-year success rates, second year in a row (degree, transfer and persistence). First in the nation to establish a Fab Lab, a digital fabrication center based upon the concepts of Dr. Neil Gershenfeld, the director of the Massachusetts Institute of Technology’s Center for Bits and Atoms. LCCC is home to the National Center for Welding Education and Training (Weld-Ed). Founded with a National Science Foundation grant, it is a national partnership between the welding materials joining industry and the nation’s community and technical colleges. Recognized by the Brookings Institute as the highest value-added college in Ohio based on earnings for graduates. Through an innovative model, students save on average up to $50,000 on a bachelor’s degree. College Credit Plus offers college credit to high school students before they graduate; 43% of Lorain County High School seniors graduate with LCCC credits. In 2016, LCCC awarded over 21,000 college credits to 2,000 high school students, saving families over $3.5 million in college costs at LCCC rates and over $10 million at a public university rate.